From the Citgo Sign to the R2-D2 building. See it larger. 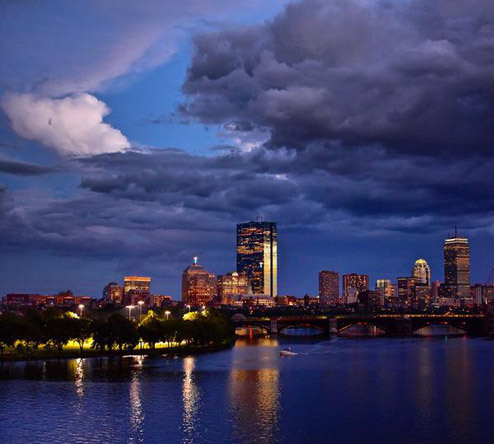 Eagle-eyed kaiju fan Chris Devers alerts us that the trailer for next summer's "Godzilla: King of the Monsters" features Boston being destroyed by a tsunami (coming, oddly, from Cambridge). Read more. The Boston Architectural College Library peered into the abyss over the Back Bay this morning. Others took note of the fog as well: Read more. 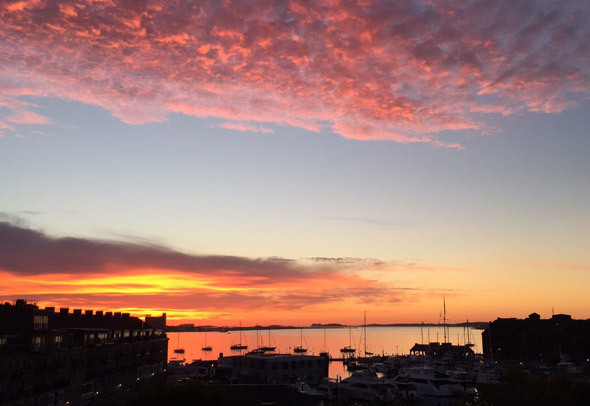 John Gage watched a rain cell mover across Boston around 6 p.m.
Christine Sullivan watched the sun come up over Boston Harbor this morning. She wasn't alone: Read more. The Hancock Building got an interesting look for a few minutes after this afternoon's downpours as the clouds moved away. Meanwhile, out in Roslindale: Read more. Where's her pot of gold? 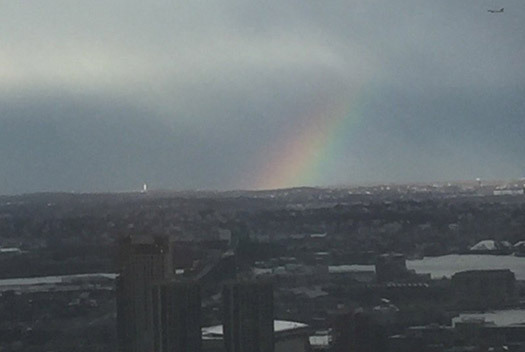 Jan spotted a rainbow shortly before 5 p.m. from the 49th floor of the Hancock building. Around 1:45 p.m. at Castle Island. The view across Pleasure Bay towards the Kennedy Library was equally dramatic: Read more. Kathleen O'Donnell looked up this morning, but couldn't see very far. 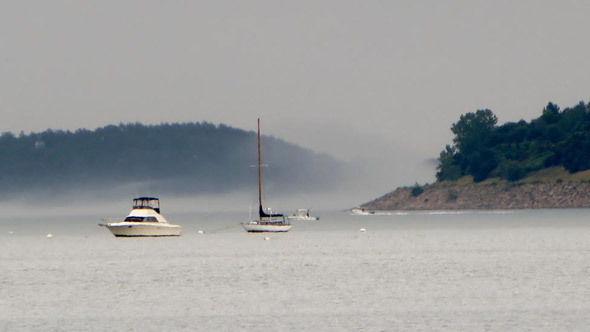 Julie Ciollo notes it was a little foggy in the Back Bay this morning. Hancock Man this morning. Photo by Mari Passananti. 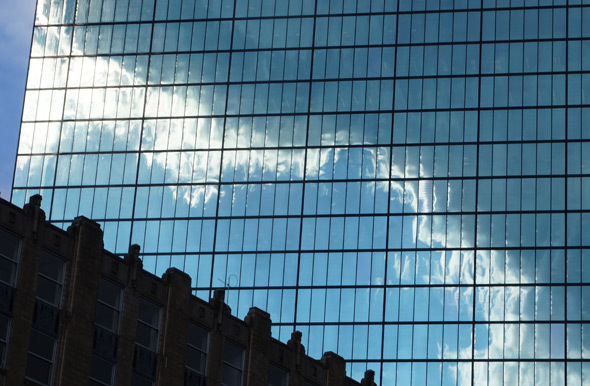 The Globe reports on the vague portrait that started going up on the Hancock tower yesterday. Some of JR's other work. Manu looked up to an odd sight on the Hancock this morning. The new owners of "200 Clarendon" say the art will take 7-10 days to complete and that they'll reveal the artist's name after that. JB Parrett watched the evening storm roll in over the Back Bay. 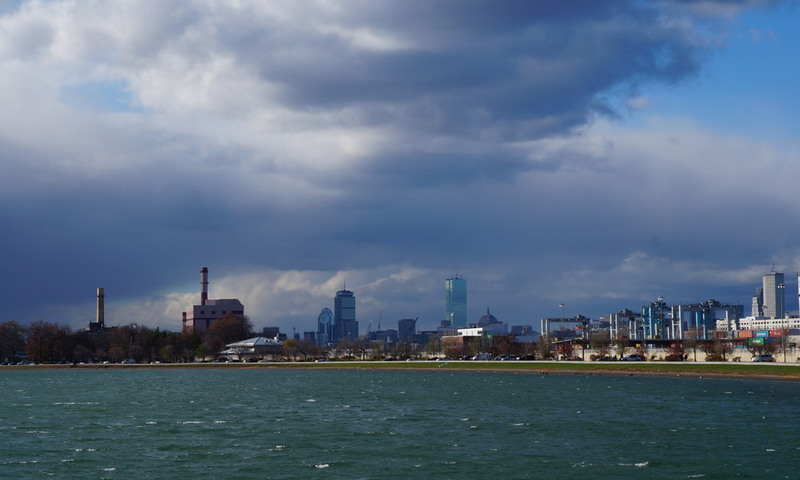 Eileen Murphy spent some time today watching the fast changing weather over Boston Harbor. One moment fog, then the skies brightened: Read more. 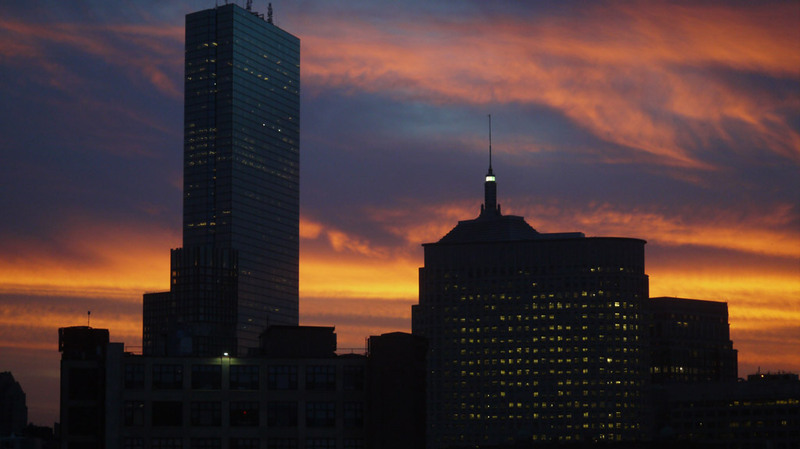 A roving UHub photographer enjoyed the sunset over the Back Bay from the Ink Block in the South End tonight. Where'd the rest of the city go? 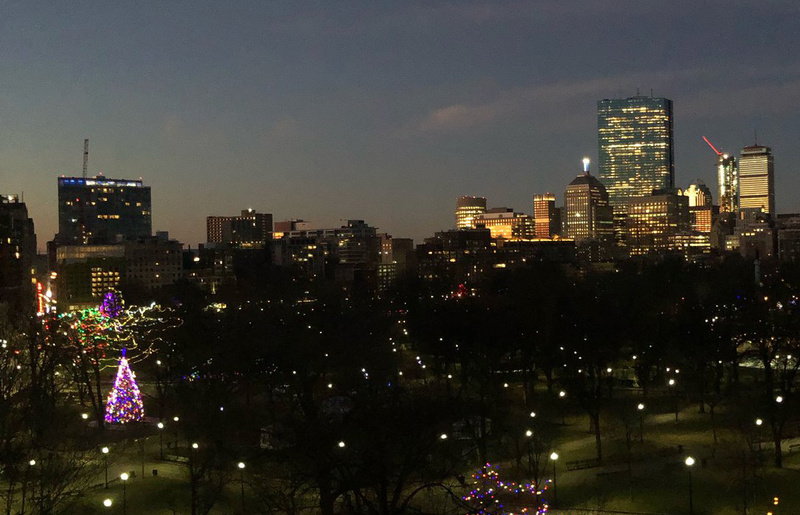 Jared, who happened to be up at 6:13 a.m., took a screen capture of the Blue Hill Observatory's east cam atop the Prudential tower. 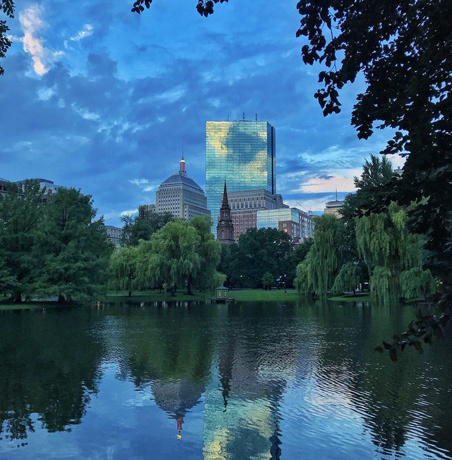 The Pru from the Hancock. Back Bay from the air. JB Parrett captured the scene.